Reviews as posted on Sawdays Special Places website. "Hacton Cruck is wonderful and we feel privileged to have stayed in such a fabulous place. Thank you so much and I do hope we will be able to visit again soon." "What a beautiful place. We felt like Lord and Lady of the Manor staying at Hacton Cruck. The building itself is fantastic but unusually for self catering accommodation, everything inside it is top quality (e.g. Denby crockery, Hypnos beds, Christie towels). The owner obviously has very good taste. Our only issue was with how drafty it was. For most of the year, I don't think this would be a problem but we went shortly after Storm Doris and we did struggle to keep warm at times. This won't stop us from going back though, we fell in love with Hacton Cruck, the place is magical." "Staying at Hacton Cruck is always a special experience: this time it was a wet weekend, but it didn't dampen our enjoyment, especially with the plentiful supply of wood for the fire. The atmosphere is created by the obvious long history of the building, by the quality of the furniture and all of the domestic arrangements, not least the many tapestries on the walls. It is also a very good centre for visiting places of interest- we found it an ideal place for any Kilvert enthusiast- not only is it pleasingly close to many of Kilvert's locations, but the local vicar was one of his friends"
"This was our second stay at Hacton Cruck and it was as wonderful as the first time. We still sat and admired the workmanship that has gone into the restoration it's superb. We never venture far during our stay preferring to remain in the cruck as much as possible, we were cozy, warm and very comfortable. We will definitely be back." "This is our 4th year at Hacton Cruck. The house is beautifully restored and after days spent walking in the Brecon Beacons it is wonderful to come back and relax together as a family in front of the fire. The magic of the place for us is that with the kids aged from 5-9 we can all be together in the one big open space whether we are cooking, reading or drawing by the fire. It's a great testimony to how well the house is looked after that in the 4 years we have been coming there, there seems to be no wear and tear at all. Historic beauty matched with all the mod cons a family could need." "We spent a glorious Christmas here. That beautiful open space twinkled with fairy lights and there was a real Christmas tree in the turn of the stairs. The fire was roaring and my jaw dropped. What an amazing experience to stay in such a unique and lovingly presented building. Everything works and there is a feeling of generosity throughout. Loads of chopped wood and kindling, ground coffee, spices, boxes of teas, comprehensive Denby crockery including jugs, meat platter, casseroles. Fantastic 16th century table. Dilys, the caretaker, found a vest I'd left behind and posted it unbidden, wow." 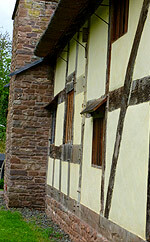 "The passion for the restoration is seen from every angle"
"Hacton Cruck is a truly special place. The building has been lovingly restored and provides a luxurious environment within a piece of history. We received detailed directions and a friendly welcome once we arrived, and then were left to enjoy our week of seclusion. Fixtures and fittings are excellent, the wood pile well stocked and the tapestries beautiful. 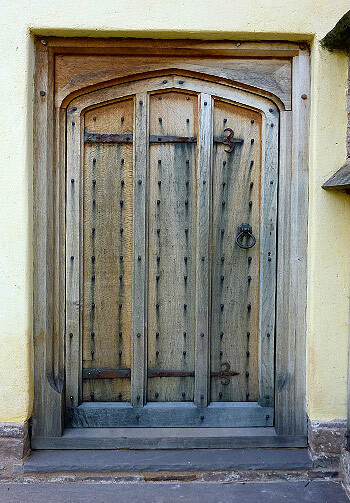 If there is another medieval hall surrounded by apple orchards that is available as a holiday destination (which I doubt) then it still wouldn't be Hacton Cruck, because this place is unique. Wonderful. " 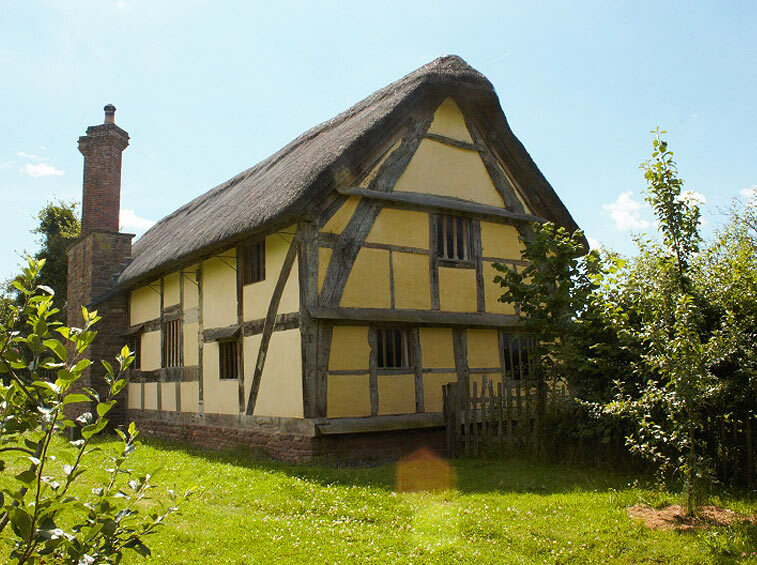 "We were delighted to find such an interesting holiday property as a medieval hall and Hacton Cruck did not let us down. It was amazing to walk in and see the restored interior. There’s lots to look at as it is filled with historic details and touches. It is also very comfortable and well equipped and out-ranks many other cottages that we have stayed at. Hacton Cruck sits apart from the village among trees so sitting outside is peaceful and private. Many things made this place special such as its history, the log burner and the well visited bird feeder. We will definitely visit again. " "Remarkable restoration, renovation and modernization - this is truly a unique cottage experience surrounded by centuries of history, sensitively rescued and updated with the highest level of craftsmanship, imagination, design and aesthetic. It's also wonderfully tranquil, very private with nothing else except the sound of the birds and animals in the distance so it's a terrific getaway from the hustle and bustle of daily life (although you can still check in with wi-fi....). The kitchen has all the amenities, and the beds are really comfortable. Congrats Phil on reviving Hacton Cruck!" "Amazing restoration. Really good compromise between medieval look and 21st century amenities. The conversion is to a very high standard and the furniture which Phil made from his own oak trees is really beautiful. Hacton Cruck makes an excellent centre. We visited Hereford, Hay-on-Wye and Abbey Dore as well as many of the excentric and beautiful medieval churches in the area."